Texas A&M has been trying -- and trying -- to join the SEC. When the Aggies officially join next year -- it will mark the conference's first expansion in more than 20 years. "We hope," Savage said, "they're going to re-extend their offer to Sewanee." Naturally, that's a joke. Sewanee is no SEC school these days. It's respected, sure. Gorgeous, of course. A tiny, tight-knit, mid-Tennessee Episcopal university with Division III sports, Sewanee -- officially known as the University of the South -- is the kind of place some never leave and most never stop loving. But there's something important about what Savage said: re-extend. Because nearly 80 years ago, Sewanee co-founded the SEC with 12 other colleges, all of which remain in the NCAA's Football Bowl Subdivision -- 11 of them in major conferences and 10 in the SEC. That's right. Alabama, Auburn, Florida. Georgia, Georgia Tech, Kentucky. LSU, Mississippi, Mississippi State. Tennessee, Tulane, Vanderbilt. And Sewanee: the lost school of the SEC. Now, don't consider Sewanee too lost. It's done just fine in the 70-plus years since leaving the conference, boasting 25 Rhodes Scholars, beautiful forest-capped bluffs, captivating Gothic architecture and an alumni base that can't say enough good things about its school. The phrase might not be memorized as often as Spanish vocab or PolySci notes, but it's prominent on campus. On the mouths of former and current student-athletes. On the occasional tour around campus. Even on some posters. "Five wins in six days, and on the seventh day they rested." "They use [it] as a recruiting tool," said Savage, who played quarterback at Sewanee in the 1980s. Those are not misprints. 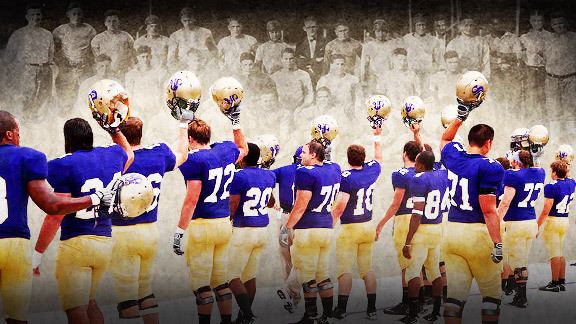 Nor are the scores of Sewanee's seven other wins that year -- all but one by shutout -- giving the team a 12-0 record, the distinction "Champions of the South," the Southern Intercollegiate Athletic Association title, and the right to be known as the "Iron Men" -- one of the most accomplished college teams ever. It didn't stop there. Ten years later Sewanee claimed another SIAA title, the school's third. Consistent winning lasted into the 1920s, and the school even amassed winning all-time records over some of today's college football stalwarts. Against LSU: 6-3. Auburn: 7-4-1. Ole Miss: 8-6-1. Both Georgia and Georgia Tech: 7-5-1. "There is zero probability," Sewanee athletic director Mark Webb said with a laugh, "of us ever playing them again." There was a time, historians say, when playing them couldn't have made more sense. In the late 1800s and early 1900s, many private schools were the same size as their public counterparts. Some adopted football earlier. Most mined nearby prep schools -- several of which were near Sewanee, then an all-male college -- for the small amount of talent available at the time. Add to that a coach, Billy Suter, with ties to the powerful Princeton program and a South region that wasn't remotely as competitive as today, and Sewanee's early success was explicable. But it came with an expiration date. 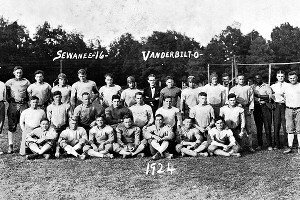 The University of the South Sewanee beat in-state rival Vanderbilt 16-0 in 1924. "With time, all those public institutions became much bigger and committed more and more to football," according to Richard Scott, author of "SEC Football: 75 Years of Pride and Passion," and other football books. Sewanee couldn't keep up. Not with recruiting, not with the rise of athletic scholarships, not with the hiring of coaches, and eventually, not with their rivals' success. That last one created an inescapable cycle, since -- as Tex Noel of the Intercollegiate Football Researchers Association said -- "everybody wants to go to a school that wins." Suddenly, power turned to powder. On Sept. 30, 1933, the Sewanee Purple Tigers visited the University of Kentucky for the first football game in the newly created SEC. The score: Kentucky 7, Sewanee 0. It never got better. Well, it did once; in a 1938 contest, Sewanee lost to Florida by just four points, 10-6. Sewanee lost all 37 of its SEC games (played from 1933 to 1940). The Tigers were shut out more than twice (26) for every game in which they scored (11). In 1935, they went 0-6 in conference and were outscored 189-0. In '37, it was SEC 204, Sewanee 7. The school's final aggregate SEC score: 1,163-84. At least their fans weren't around to see the carnage. With a small on-campus stadium making road games more lucrative to the university, Sewanee played every SEC contest away from home. "Sewanee became what you might call the homecoming game," said former vice chancellor (akin to university president) Samuel Williamson, now a school historian. In truth, some at Sewanee saw this coming before the SEC formed. The school had a record above .500 just once since 1924, the first year of the Southern Conference, the SEC's predecessor. The aforementioned rise of scholarships also left the small school at a disadvantage relative to its nearby counterparts, and then-vice chancellor Benjamin Ficklin Finney is said to have wanted no part of it. 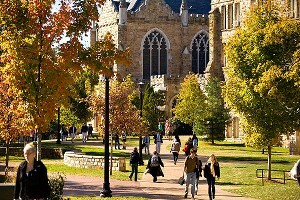 The University of the South Sewanee's campus is nestled in the Cumberland Plateau between Nashville and Chattanooga. But with Sewanee's storied tradition and influential backers such as Bishop Frank Juhan -- a College Football Hall of Famer who loved the sport and supported the team for decades after his playing career -- Finney "was under enormous political pressure to join the conference," Williamson said, and try to keep up. "I'll only come," Guerry said, according to Williamson, "if we get rid of scholarship athletics." Some say that stance was an early move toward the creation of the NCAA's nonscholarship Division III. For Sewanee, it soon led to leaving the SEC, more than two decades before Georgia Tech (1964) and Tulane (1966) did the same for similar reasons. Two years into Guerry's tenure -- with its league schedule already whittled to a single game (against nearby Vanderbilt) -- the Little School that Once Could withdrew from the SEC. "A small liberal arts college simply can not compete in football with large universities," Guerry wrote at the time. But that doesn't render it worthless. On a typical fall Saturday, the signature Sewanee fog will roll into campus along with another small-school football team. Soon after, the Tigers will cross the same old bridge as those Iron Men of 11 decades yore, and play on the same old field -- said to be the fourth-oldest in the U.S., one whose relaxed, social atmosphere is a tad different than what you will find in Knoxville or Baton Rouge or Tuscaloosa. "It's real special to be a part of that," said Robert Black, an alumnus who coached the football team for four years until moving into university relations this year. It's also just a part of life -- not a way of life -- on Sewanee's tiny campus, which rests several miles off Interstate 24 in the middle of a surprisingly large school-owned plot of land (about 13,000 rocky, foresty acres) widely known as "The Domain." 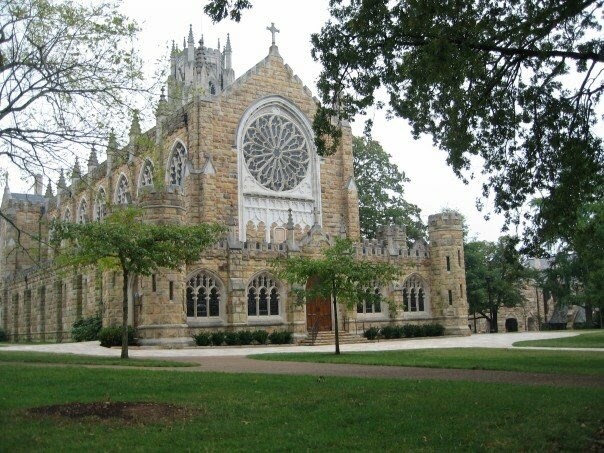 The University of the South Sewanee will move into a new conference next year. On The Domain -- like at most Division III colleges -- nonsports life reigns, be it in school, social activities or the outdoors. Even class seems like a throwback to another time -- not quite to the days before Sewanee went coed in 1969, but to an era when skirts for the women and ties for the men were demanded by professors (now it's merely "a suggestion," according to Meg Welton, a senior lacrosse player whose mother, Becky, played basketball and volleyball at Sewanee). 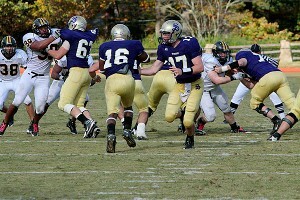 Still, Sewanee wants to win in sports, no matter which one (it offers 24 at the varsity level). And it does, sometimes -- even in football, although the school has struggled in recent years (just six wins total from 2006-10). The Tigers went undefeated in 1958 and 1963, under coach Shirley Majors, father of Johnny Majors, the former Tennessee and Pittsburgh coach who won the 1976 national title with the Panthers. They won a share of the Southern Collegiate Athletic Conference championship in 2000, own 13 total conference titles and have produced noteworthy alumni such as Savage and North Carolina offensive coordinator and former NFL assistant John Shoop. Through it all, the program remains tight-knit, with frequent reunions commemorating everything the school has accomplished. "Everybody knows everybody," said Larry Majors, Shirley's son, and a former Sewanee player under his dad. So what about it, Sewanee? If the team can string together a few strong seasons under new coach Tommy Laurendine and capture a couple championships in its new conference, might it push to rejoin an expanded SEC? "I don't want to rule that possibility out," current vice chancellor John M. McCardell Jr. said. "But it's probably unlikely." Patrick Dorsey is a writer based in South Florida and a regular contributor to Page 2. He can be reached at bypatrickdorsey@gmail.com.